The high coverage Denisova genome had been made available online in February, and now the paper to accompany it has appeared in Science. I do appreciate the fact that the Max Planck folks did not wait until publication to share their data; anything that can accelerate the process of scientific discovery is good in my book. I'll post any comments on this paper as an update when I read it. Meyer's breakthrough came in developing a method to start the sequencing process with single strands of DNA instead of double strands, as is usually done. By binding special molecules to the ends of a single strand, the ancient DNA was held in place while enzymes copied its sequence. The result was a sixfold to 22-fold increase in the amount of Denisovan DNA sequenced from a meager 10-milligram sample from the girl's finger. The team was able to cover 99.9% of the mappable nucleotide positions in the genome at least once, and more than 92% of the sites at least 20 times, which is considered a benchmark for identifying sites reliably. Back in Leipzig, the mood is upbeat, as researchers pull fossil samples off the shelf to test anew with "Matthias's method." First on Paabo's list: Neandertal bone samples, to try to produce a Neandertal genome to rival that of the little Denisovan girl. First, the new method will probably open new vistas in ancient DNA, as it represents an order of magnitude improvement in the amount of coverage that can be accomplished. Based on the differences in branch length to the common ancestor of human and chimpanzee (1.13% to 1.27%; see Table S13), we estimate that the observed branch shortening corresponds to 73,614 – 82,421 (average 75,443) years assuming a human-chimpanzee divergence time of 6.5 million years. Note that recent developments in dating human-chimpanzee divergence may push it to an older date than 6.5 million years. But, even if that date is accepted, the Denisova specimen is now the oldest Homo sequenced and our ability to get high-coverage DNA from a ~75ka specimen means that we may be getting DNA from other really old samples. Human evolutionary genetics is going to be very interesting in the coming years! Interestingly, we find that Denisovans share more alleles with the three populations from eastern Asia and South America (Dai, Han, and Karitiana) than with the two European populations (French and Sardinian) (Z=5.3). However, this does not appear to be due to Denisovan gene flow into the ancestors of present-day Asians, since the excess archaic material is more closely related to Neandertals than to Denisovans (Table S27). We estimate that the proportion of Neandertal ancestry in Europe is 24% lower than in eastern Asia and South America (95% C.I. 12-36%). This finding is important, because it shows that the simple model of modern humans expanding Out-of-Africa, interbreeding with Near Eastern Neandertals and carrying on to the rest of the world, carrying with them a fraction of Neandertal ancestry is incomplete. Some explanations for this finding are discussed on p. 41 of the supplement. The fact that Neandertals were a West Eurasian-distributed species is at great odds with the finding of greater Neandertal admixture in Asian/American populations. But, if the Iceman, and, by implication, Paleolithic Europeans were more similar to Neandertals still, a further complication is added. This may be consistent with ideas from palaeoanthropology about great levels of variation in late Pleistocene humans compared to recent ones. One can imagine that groups varied substantially in their proportions of Neandertal ancestry until fairly recent times, but homogenizing gene flow evened out what was initially a very uneven distribution, but not completely. The paper appears in a transitional period in our understanding of mutation rates. So, while it presents a much better Denisova genome than the earlier published one, our understanding of how and when the Denisova population diverged from modern humans is now less clear. I have covered some of the mutation rate controversies recently on the basis of three papers: Kong et al., Sun et al., and Langergraber et al. An important date in human evolution is when the ancestors of modern humans diverged from Denisovans and their sister group the Neandertals. In the paper on the draft sequence of the Neandertal genome, we estimated this date for Neandertals (1). Since Denisovans are a sister group of Neandertals (2), they should have approximately the same population divergence; however, we never assessed this directly. Furthermore, the inference in the Neandertal genome paper was based on assumptions about mutation rates from early 2010. Since that time, better data have become available, lower mutation rates have been suggested, and the true value of the mutation rate has become less certain. It is important to obtain a new date estimate in light of this. Paleontological calibration can only take us so far; for example, Neandertaloid traits in the Atapuerca hominins suggest an early split with modern humans and therefore a low mutation rate, but they also suggest a much earlier human-chimp speciation time than commonly thought. I think that a technical solution to the problem will eventually be found, which will show why there is the 2-fold difference in mutation rate estimates. The plot on the left shows inferred changes in population size for 12 different populations, using the PSMC approach of Li & Durbin. One can see that the different populations seem to match quite well until ~750/375ky (depending on mutation rate), when Denisovan population starts decreasing, and the population of the modern human groups starts increasing. Then at ~110/55ky, population sizes in modern humans begin diverging. There are two ways to look at this: if one assumes tree-like divergence of population, then obviously the fact that Denisova spends the period between 750/375 to 100/50ky at a much lower population size than modern humans speaks of an isolated population with limited genetic diversity. 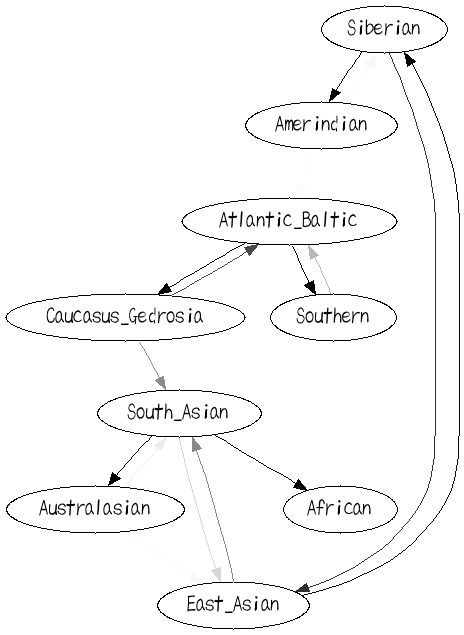 But, as I've mentioned before in this blog, genetic diversity can be created by admixture. Take two populations that diverged a long time ago, even ones with low intra-population diversity, mix them, and the end result will be one very diverse population. In the absence of admixture, variation is generated by mutation, and culled by drift and selection. But, mutation is a random process that adds variation incrementally into the population, with new alleles appearing at a rate ~ to the number of breeding bodies times the mutation rate/per genome. Admixture, on the other hand, introduces a whole bunch of new alleles in a limited amount of time. Homo heidelbergensis emerges in western parts of the Old World c. 750ky. Whatever adaptations gave heidelbergensis a bigger brain than erectus spread quickly throughout Europe and Africa. Admixture between European and African hominins at this time and/or expansion of the H. h. population lead to an increase in population size. 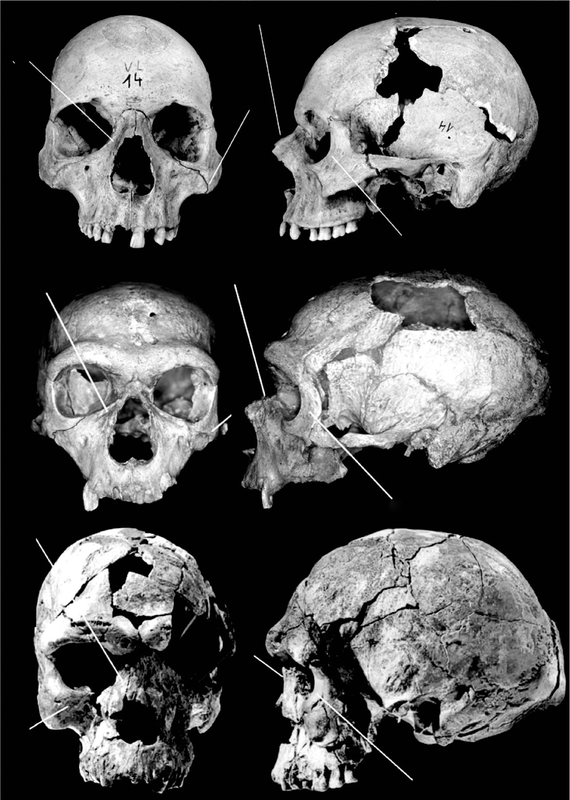 Further east, heidelbergensis is less visible, and older erectus populations persist. The Denisovan population can then be seen as an eastern H. h. that had more limited opportunity to expand and/or experience gene flow, because of its remote location; the Deniosovans were not unlike isolated Siberian groups of today: substantially less diverse than the bulk of mankind. 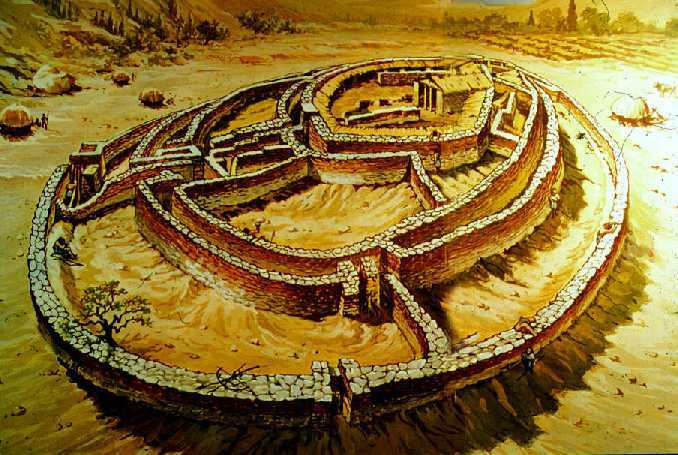 Pre-100ka sees the rise of the modern humans. According to my "two deserts" theory, these were a population of AMH living in North Africa. Post-100ka population histories begin to diverge, but with all population sizes decreasing (consistent with the rise of behaviorally modern humans carrying a small subset of the genetic variation in the broader group of archaic H. sapiens / anatomically modern humans). This is the major bottleneck of modern human origins that has transformed us into a fairly homogeneous species. But, Africans and non-Africans follow different trajectories, with the former maintaining higher population sizes than the latter. 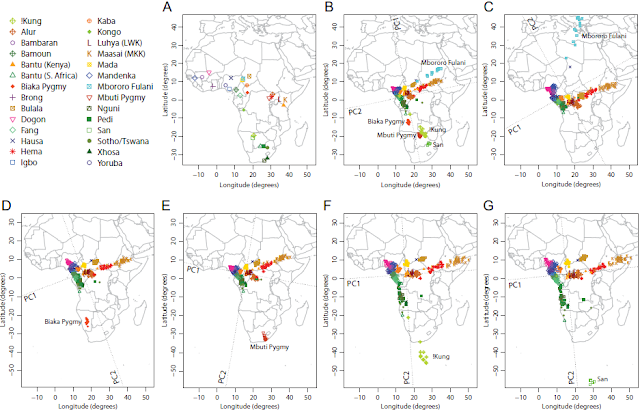 This is probably related to the ecological calamities that befell Eurasians during the 100-50ka period (notably the drying up of the Sahara-Arabia belt post-70ka and /or the Toba eruption), and also to a partial breakdown of African population structure as modern humans expanded deeper into Sub-Saharan Africa and started mixing with pre-existing humans living there, consistent with signals of archaic admixture detected for this period. is negative when X does not appear to form a simple tree with A and B but appears to be a mixture of A and B. In a previous entry, I noted that continental European populations, and especially northern Europeans appear to have East Eurasian-like admixture on the basis of the 4-population test. The results of that test are more difficult to interpret, because the quantity f4(X, Y; A, B) can take significant negative or positive values depending on the relationships of populations X, Y with A, B. When A, B are East Eurasian and African populations respectively, and X, Y are West Eurasian ones, East Eurasian-like admixture in a northern European population will affect the f4 quantity similarly as African-like admixture in a southern Caucasoid one. This is not a problem with the f3 test, although caution is needed: a negative value indicates deviation from "treeness" and admixture, but a positive one does not reject admixture. The f3 statistics were calculated with the threepop program of TreeMix with -k 500 over a set of 598,467 SNPs. I thus report 2*(14 choose 2)*3 = 546 values of f3. Hence, I did not privilege Sardinians as a reference point, but instead tried all pairs of West Eurasian populations, and 3 different American/Asian references. There results can be found in the spreadsheet. Out of the 546 triples, 64 show an f3 score less than Z less or equal to -3, and are thus significant. Note that east Eurasian-like admixture cannot be rejected for the other populations, but it can be confirmed for the above. 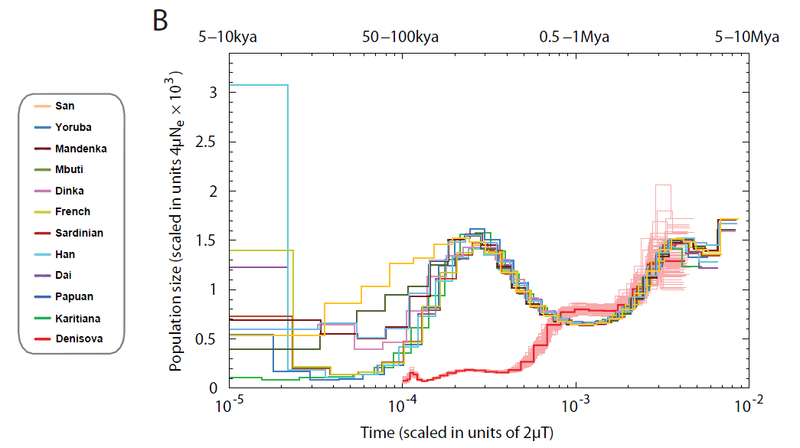 Moreover, the mean strength of the observed effect for the significant comparisons was Z=-5.5 for Papuan reference, Z=-10.2 for CHB, and Z=-10.9 for Karitiana, again suggesting a northern origin of the east Eurasian-like admixture, albeit without so major a difference between Karitiana and CHB as in the 4-population test. But, it is worth reading the raw data. 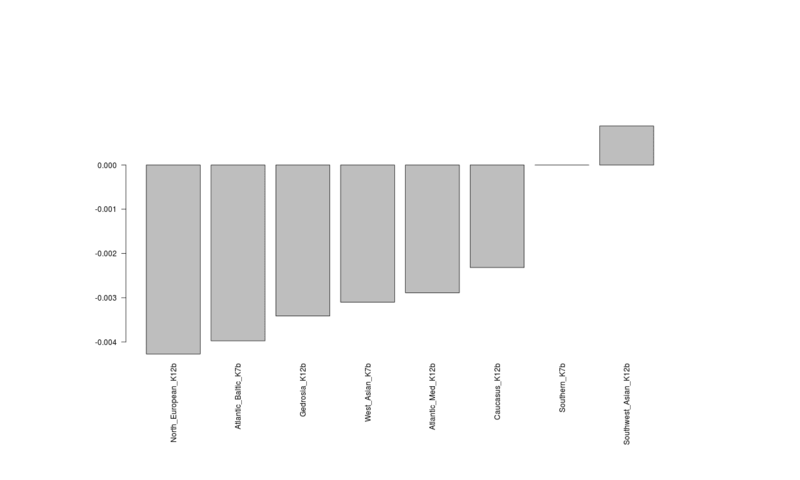 For example, note above that of the Middle Eastern and North African populations, only Palestinians show a negative f3 score in any pairwise comparison. And actually they only do so for f3(Palestinian; Sardinian, Papuan) with a Z-score of -4.1. So, it appears that Palestinians have undergone admixture of a different sort than Europeans. Significant differences were observed for Sardinians as West Eurasian 2 in 21 cases, for French Basque in 11 cases, for North_Italian and TSI in 6 cases, for CEU, Orcadian, French, and Tuscan in 4 cases. So, it appears that other populations appear east Eurasian-liked admixed relative to Sardinians, and a couple of populations (Russian and Adygei) also appear so admixed relative to west Europeans. The fact that Europeans appear admixed with an east Eurasian-like element when compared with Sardinians does not mean that Sardinians may not also be admixed with this element. 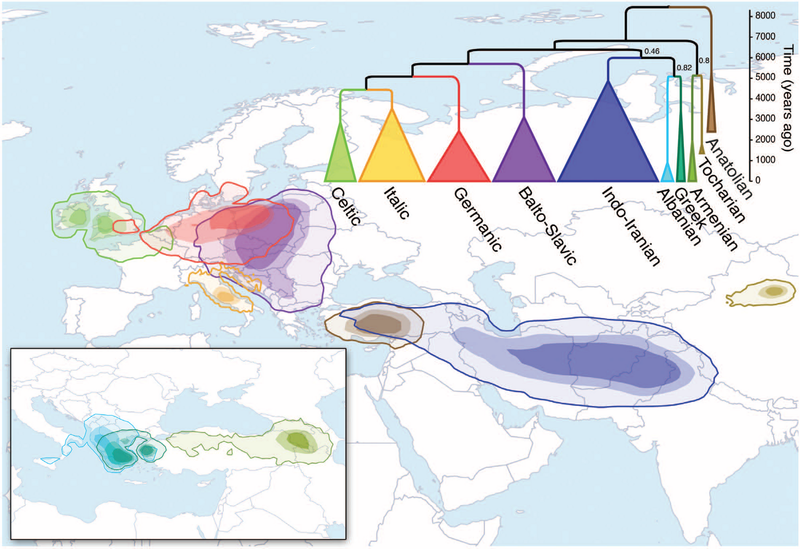 I used the genome of the Tyrolean Iceman (Keller et al. 2012) to test whether Sardinians appear east Eurasian-like admixed relative to the Iceman. You should probably not take my word for the above. It may appear that, contrary to expectation, Oetzi was more east Eurasian-like than modern Sardinians. Indeed, in my initial analysis of him with ADMIXTURE, I found that he was 2.8% East_Asian, which would point to an East Eurasian shift of Oetzi relative to Sardinians, and which might be consistent with the f4 result. On the other hand, the negative f4 score could be related to African-like gene flow. On balance I would say that Sardinians appear quite similar to Oetzi. While I would not bet the farm on these results (because of the small number of SNPs and the fact that they're based on a single individual), they do seem to suggest that these Neolithic Swedes were east Eurasian shifted relative to Sardinians. 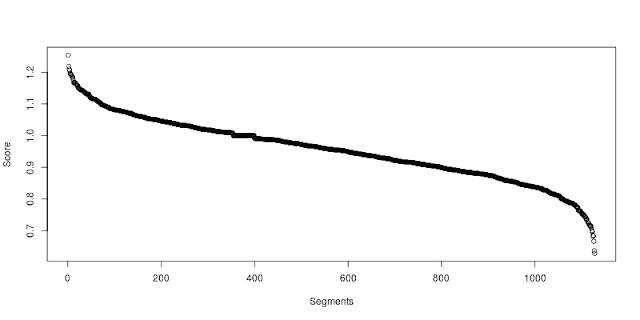 For example, for my Swedish_D sample, I get f4(Sardinian, Swedish_D; Karitiana, San) = -0.00372751 (Z=-22.8715). The Z-score is stronger (probably because of the much larger number of SNPs), but the f4 value of Ajv52 is lower (more east-Eurasian like). Modern Swedish_D appears intermediate between Gok4 and Ajv52, so this may suggest that Mesolithic Europeans may be, at least in part the source of this element. (Comparison with Brana-1 Mesolithic Iberian indicates a negative non-significant f4 score, but with an even smaller number of SNPs). In sum total, my experiments with ancient DNA samples from Europe suggest a little more east Eurasian-like shift relative to Sardinians (or conversely a little more African-like shift in Sardinians). Both Oetzi (who has the highest quality genome) appears to be so-shifted, but Ajv52 (a Neolithic northern hunter-gatherer) appears to be so as well. I am sure that if we get more high quality ancient DNA from Europe, some clear pattern may emerge, but I would not speculate further on the basis of these initial results. The above set of experiments has revealed once more that "there's something about Sardinians." There is perhaps a reason for the fact that the arrival of population elements from continental Europe seems to have bypassed them to some degree, or, at least affected them least. 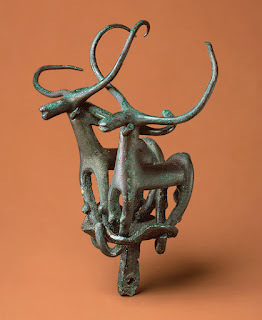 However it was that continental Europeans got their east Eurasian-like shift, the great tank of European genetic variation does not seem to have achieved equilibrium with the little cup of Sardinia. Something stood in the way. Sardinia is the west-most of the large Mediterranean islands. It is more distant from mainland Europe/Asia than the other big islands (Cyprus, Crete, Sicily, and Corsica). And, unlike islands much smaller than itself, its size has probably been instrumental in helping it afford it a certain autonomy and continuity of population. Only Sicily is largest, but one can practically swim across the Strait of Messina to reach it from the Italian peninsula. Hence, a combination of large size, western geographical location, and distance from the mainland have contributed to the continuity of its population. But, geography may not have been sufficient if other events had not taken place. Through a combination of favorable geography and historical contingency, the Sardinians made it to the present largely unscathed, and, among their other graces, can now help scientists figure out what happened to the rest of us. 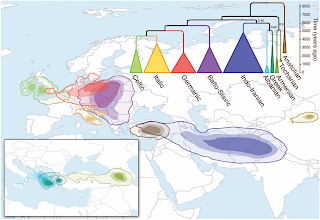 A new paper argues that the SE-NW gradient of genetic variation in modern Europeans is consistent with a large Paleolithic contribution of the European gene pool if modern Europeans are principally descended from people who spent the last Ice Age in the Iberian refugium. In my opinion, the question cannot be solved on the basis of modern populations alone: clines do not carry dates, and can be formed by accretion of different events operating under the constraints of a given geography. Ancient DNA has already begun to inform our view of the past: we now have data from Mesolithic Iberians, the presumable denizens of a pre-farming refugium, and they do not appear closely related to modern Iberians. Moreover, Europe as a whole shows discontinuity between Neolithic and Mesolithic populations, and even between Neolithic and modern ones. If humans expanded from Iberia in postglacial times, and modern Europeans are largely descended from them, then it is strange that the gene pool of Mesolithic Europeans is so restricted: why didn't the Out-of-Iberians create a modern European-like mtDNA and Y chromosome gene pool in the thousands of years intervening between deglaciation and the available DNA samples? Arguably, the ancient DNA record of Europe (except in the case of mtDNA) is still in its infancy and there may be more surprises to come. But, the way things look like right now, Paleolithic genetic continuity does not seem warranted. As more ancient samples accumulate from different regions and different periods, we will see how clines of variation in modern populations were formed. But, if history of the field is any guide, we're probably in for a few strange surprises. Cavalli-Sforza and colleagues (1963) initiated the representation of genetic relationships among human populations with principal component analysis (PCA).Their study revealed the presence of a southeast–northwest (SE-NW) gradient of genetic variation in current European populations, which was interpreted as the result of the demic diffusion of early Neolithic farmers during their expansion from the Near East. However, this interpretation has been questioned, as PCA gradients can occur even when there is no expansion, and because the first PC axis is often orthogonal to the expansion axis. Here, we revisit PCA patterns obtained under realistic scenarios of the settlement of Europe, focusing on the effects of various levels of admixture between Paleolithic and Neolithic populations, and of range contractions during the Last Glacial Maximum (LGM). 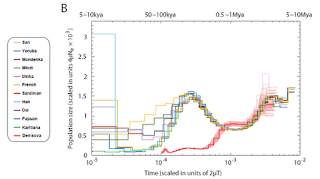 Using extensive simulations, we find that the first PC (PC1) gradients are orthogonal to the expansion axis, but only when the expansion is recent (Neolithic). More ancient (Paleolithic) expansions alter the orientation of the PC1 gradient due to a spatial homogenization of genetic diversity over time, and to the exact location of LGM refugia from which re-expansions proceeded. Overall we find that PC1 gradients consistently follow a SE-NW orientation if there is a large Paleolithic contribution to the current European gene pool, and if the main refuge area during the last ice age was in the Iberian Peninsula. Our study suggests that a SE-NW PC1 gradient is compatible with little genetic impact of Neolithic populations on the current European gene pool, and that range contractions have affected observed genetic patterns. My default position is to doubt all molecular dates until I understand how they were derived. 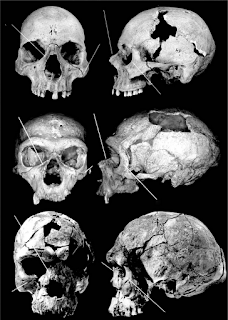 Nonetheless, these results seem broadly consistent with the idea that Eurasian modern humans got lighter as their ancestors moved into more northern latitudes of the Old World and replaced Neandertals and others earlier Eurasian occupants, and then they got really lighter post-LGM, and then some got really really lighter with mutations in genes such as SLC24A4 (not studied here). I suppose we will really find out who got what mutation when only through ancient DNA. The inverse correlation between skin pigmentation and latitude observed in human populations is thought to have been shaped by selective pressures favoring lighter skin in order to facilitate vitamin D synthesis in regions far from the equator. Several candidate genes for skin pigmentation have been shown to exhibit patterns of polymorphism that overlap the geospatial variation in skin color. However, little work has focused on estimating the timeframe over which skin pigmentation has changed and on the intensity of selection acting on different pigmentation genes. To provide a temporal framework for the evolution of lighter pigmentation, we used forward Monte Carlo simulations coupled with a rejection sampling algorithm to estimate the time of onset of selective sweeps and selection coefficients at four genes associated with this trait in Europeans: KITLG, TYRP1, SLC24A5, and SLC45A2. 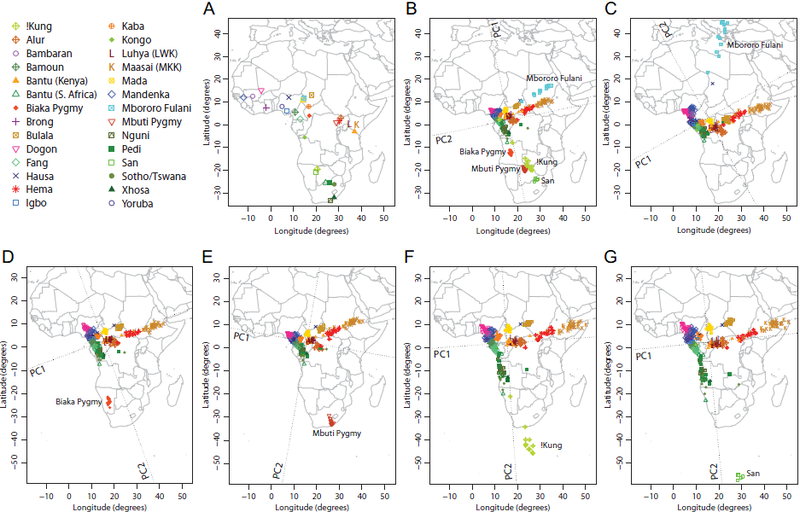 Using compound haplotype systems consisting of rapidly evolving microsatellites linked to one SNP in each gene, we estimate that the onset of the sweep shared by Europeans and East Asians at KITLG occurred about 30,000 years ago, after the out-of-Africa migration, while the selective sweeps for the European-specific alleles at TYRP1, SLC24A5, and SLC45A2 started much later, within the last 11,000-19,000 years, well after the first migrations of modern humans into Europe. We suggest that these patterns were influenced by recent increases in size of human populations, which favored the accumulation of advantageous variants at different loci. I used each of the 12 different components as "test data" in a supervised ADMIXTURE analysis that used the other 11 components as "reference data". This simple procedure can show what each component appears to be made of, if it is seen in the context of the remaining components. It is a good way to demonstrate relationships between them. The most salient point about this analysis is the central position of the Caucasus component vis a vis the others, consistent with my womb of nations theory. Not only do all West Eurasian components (except the North European) appear substantially "Caucasus" in this analysis, but the Caucasus component itself shows links with four others. It could be argued that these results represent a confluence of peoples from all over West Eurasia into the highlands of West Asia where the Caucasus component is modal. But, the Caucasus region is arguably the most linguistically diverse in West Eurasia, and many of its languages do not appear to have come from elsewhere. Also, the Near East (where the Caucasus component is the most important one in most populations) is the birthplace of agriculture, which has demonstrably affected most of West Eurasia. 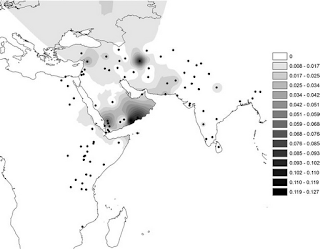 On balance, this analysis seems consistent with population expansions out of West Asia. It is the Caucasus, rather than Southwest Asian component that seems to donate to the Northwest African and East African ones. That seems to flaunt geography, but probably indicates that the Southwest Asian component, with its strong Semitic associations (see distribution in K12b spreadsheet) represents a more specialized form of the more generalized Caucasus component. Finally, remember that living populations show admixture proportions of many of these components. So, for example, the East African population often has Southwest Asian admixture, even though the East African component lacks it. 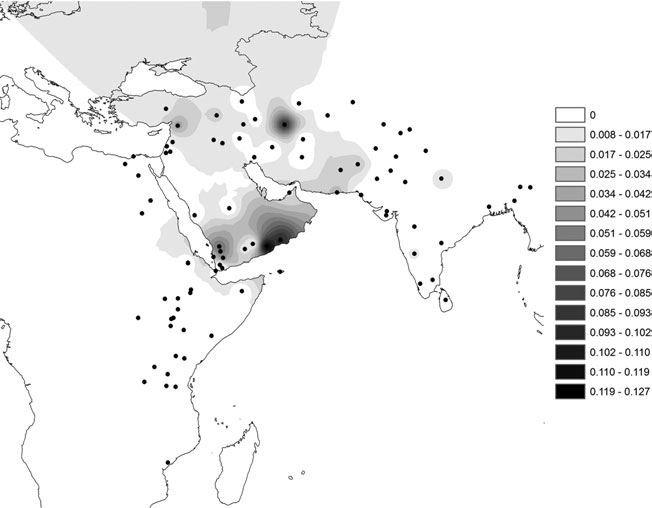 And, as mentioned above, this may reflect the more generalized west Asian admixture that has affected East Africa, as well as the more specific Arabian admixture, associated e.g., with the spread of Semitic languages. Please refer to the K12b spreadsheet for admixture proportions of populations for the 12 components. And, here is the graph showing how they seem to contribute to each other. Australasian appears South Asian. I would guess that ASI and Australo-Melanesians share deep common ancestry from the earliest settlement of southern parts of Asia. Raw data for these experiments can be found here. Fst estimates were upward biased; have now switched to the method of Reynolds et al. (1983). This probably means that many of the Fst divergences reported here and in the Dodecad blog must be reduced. This is not really a big problem, since, biased or not, the reported numbers show the relative similarity of difference components. But, I decided to investigate, so I re-ran the ADMIXTURE analysis that created the K7b calculator. Of course it would be a good idea to re-run this type of analysis separately whenever the absolute values are important. For example, in a previous experiment, I suggested that Fst's between the K12a components were so low, that these components should not be interpreted as having diverged in very old (say, Upper Paleolithic) times, but rather in a more recent (post-glacial, and probably mostly Neolithic) time frame. Correction for this upward bias would probably strengthen that hypothesis which was one way of arguing in favor of the womb of nations theory. I wanted to see how the various components related to East Eurasians. 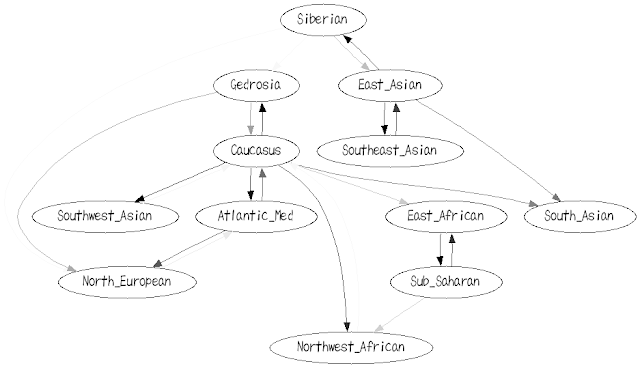 This shows the relative ordering of the different components on the East Asian-African axis. 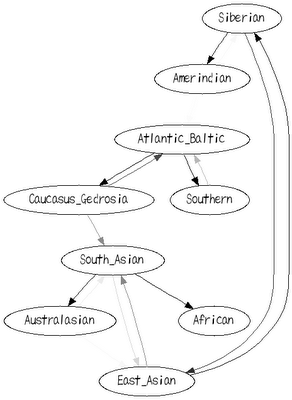 Notice that of the mainly Caucasoid components the most Asian-shifted is the North European component, the most African shifted is the Southwest Asian one. This makes sense because of the admixture phenomenon I've been describing in this series, and also the proximity of Arabia (which is where the Southwest Asian component is modal) to Africa. The existence of East Eurasian-like admixture in Europe is further supported by the following observation: both the Atlantic_Baltic and North_European components (who are the most East Asian-shifted) are mainly geographically distributed to the west of the West Asian, Caucasus, and Gedrosia components (who are less East Asian-shifted). This seems discordant with geography. On the other hand, the relative position of the Caucasus, Southern, and Southwest Asian components vis a vis Africa are concordant with geography, as their center of distribution is close to Africa along land migration routes, with Southwest Asia being closer both genetically and geographically, and Caucasus most distant. Another observation is that the Atlantic_Med component, which is modal in Sardinians and Basques is actually Asian-shifted relative to the Southern component (modal in Arabia).This might indicate the presence of some degree of East Eurasian-like admixture in Sardinia itself. So, while Sardinia may possess the minimum of this element in Europe, it may not do so in the wider Caucasoid world. Unscrambling the omelette of West Eurasian origins is no easy task. Hopefully, new statistical methods and ancient DNA will help us achieve it. Most of the coverage of the new Kong et al. paper has focused on the rising risk for inheritable diseases such as autism and schizophrenia in the children of older fathers. And, indeed, that is is the larger story, and, perhaps, the more useful one for society. We show that in our samples, with an average father’s age of 29.7, the average de novo mutation rate is 1.20 × 10−8 per nucleotide per generation. This mutation rate is in line with other direct measured rates, and is about twice smaller than the widely used 2.5x10^-8 rate used in evolutionary studies. Application of the low rate has led to a much older Human-Chimp divergence than was previously thought. That, in turn, will make mitochondrial Eve much older, because the mtDNA clock is calibrated on the Human-Chimp divergence. Practically every study of the last 10 years that looked at human origins and used the 2.5x10^-8 rate needs to be dusted off and made up to date. Most notably, the diversity in mutation rate of single nucleotide polymorphisms is dominated by the age of the father at conception of the child. The effect is an increase of about two mutations per year. An exponential model estimates paternal mutations doubling every 16.5 years. A back-of-the envelope calculation suggests that the higher age of human fathers may contribute ~30-50% more mutation in humans than in chimps/gorillas. Conversely, the mutation rate used for chimps should not be the human one: it should be even lower. The divergence of Humans from Chimps has been estimated by summing up mutations on two branches to their most recent common ancestor (MRCA). Younger chimp fathers = lower mutation rate / generation = Chimp-to-MRCA branch just got older. In other words, just as we learned than humans diverged from chimps ~7-13 million years ago, it may be that they did so even earlier. Mutations generate sequence diversity and provide a substrate for selection. The rate of de novo mutations is therefore of major importance to evolution. Here we conduct a study of genome-wide mutation rates by sequencing the entire genomes of 78 Icelandic parent–offspring trios at high coverage. We show that in our samples, with an average father’s age of 29.7, the average de novo mutation rate is 1.20?? ?10?8 per nucleotide per generation. Most notably, the diversity in mutation rate of single nucleotide polymorphisms is dominated by the age of the father at conception of the child. The effect is an increase of about two mutations per year. An exponential model estimates paternal mutations doubling every 16.5?years. After accounting for random Poisson variation, father’s age is estimated to explain nearly all of the remaining variation in the de novo mutation counts. These observations shed light on the importance of the father’s age on the risk of diseases such as schizophrenia and autism.